Not much is free in life, unless there is a catch of course, well there is no catch here and we can recover you 1% of your invoice spend going back over the last 5 years. Yes there are companies out there who do this type of work, we know that we have often gone in after them and recovered large chunks of what they miss, but not only do we recover duplicated and over payments on invoices but we also (and this is the USP) recover rebates and benefits lost through contract management shortfalls and if that’s not enough if you sign up for this programme you will also get our award winning Social Value programme for free….yes that’s free too…..so basically you get three things for free ! Yes that’s right FREE ! FREE ! FREE ! First things first let focus on cost analytics……. We process analyses, recover and optimise your Third Party suppliers spend. Looking back we analyse historic Invoice payment data and contracts to identify and recover historic overpayments and contract errors. 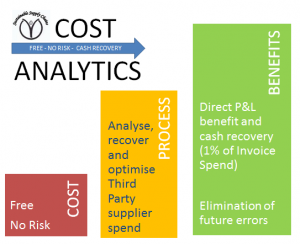 The Cost Analytics programme in simple terms recovers you revenue lost from overpayment of historic invoices (we can go back 5 years) usually about 1% of your spend (often more) and on top of that we can also recover rebates and benefits lost through contract management shortfalls. The service is free and no risk and we only take a percentage of the cash we recover for you, so there is no upfront fee, no cost for the work carried out and no work for you to do. We will get all of the money back on your behalf so there is literally nothing for you to do, apart from give us the go ahead to start work or meet us for a coffee to talk through the process. The cash starts to role in quickly and will continue to role in over a couple of months whilst we go through the process with suppliers. You can spend the money on whatever you need to and I imagine you will have a list as long as your arm from getting a project off the ground that you have not been able to previously do due to lack of budgets, you may use it to help meet savings and efficiency targets or plug gaps in service funding or whatever you want.